I seem to be continuously searching for books that will pique my girls interests and motivate them to read. I know many of you want the same things for your young readers. I also know how much of a challenge it can be to find that child/book fit. You know what I mean - that book that hooks them and makes them want to keep reading long after you've called them to dinner or told them to go to bed. The book that keeps them turning pages, till they reach the end and has them immediately wanting to pick up the next one in the series. I had a few of those in my childhood (Insert mental image of me reading the Babysitters Club by moonlight long after my parents told me to get to bed here) so I wanted to compile a list of our recent favorite series in the hopes that it would add a good read or two (or hopefully lots more!) to your book shelf. In my efforts to provide you with a variety of choices I even enlisted the help of family and friends who openly also shared their children's favorites with me via Facebook (Don't you love social media?!). I am excited to share this list with you and hope you find it useful. My 1st grader gets such a kick out of Amelia Bedelia. It's wonderful to see her work through some of the word play and laugh out loud as she reads her books. She enjoys the chapter books even more than the originals because in these books Amelia is a little girl just like her, experiencing many things for the first time. The books are perfect for this age group as they make that transition into chapter books but still need pictures and fun to keep their attention for a longer (chapter) book. This is a "newer" series that we look forward to following and reading more of as they are published. I was skeptical about this one. My daughter was drawn to it by the name and the pink tutu. I will be honest and say I had an aversion to it for the very same reasons. Well, that old saying is true - don't judge a book by it's cover. After reading the first book in the series alongside my daughter, Posey had won me over and my little one was hooked. Posey is a spunky girl who gives voice to many of the same fears and wishes that most 1st grade girls have. 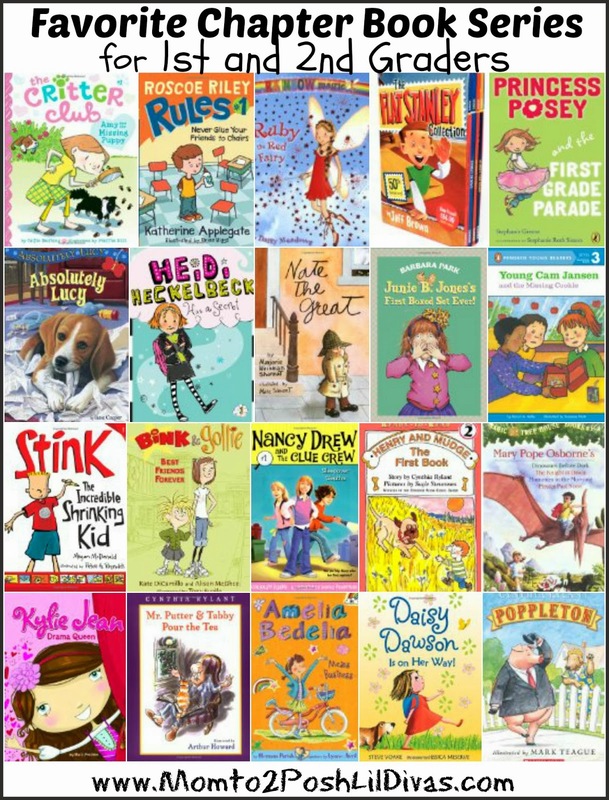 Let me just say that Posey wins out over Junie B. Jones in my book - any day! She makes mistakes, feels bad, comes clean and makes amends. Better still - she tries to do better. Posey is the kind of character that will endear little girls and not leave parents cringing. These books are definitely worth a read and are a great fit for girls aged 5-7 years old. My girls enjoy reading mysteries and trying to figure out what happened before it's revealed in the book. My oldest started reading Young Cam Jansen in Kindergarten a few years ago and we added many of the books to our home library. I was happy to find my youngest beginning to read them this year as well. These are books that as a first grader, she can easily read independently in one sitting. They are short (typically about 30-35 pages) and follow a chapter format with color illustrations interspersed throughout the book. The main character, Cam, is smart, observant and helpful and I love that these books keep my daughter thinking as she reads (she always tries to figure things out before Cam does). They make great beginning chapter books for any young sleuth or mystery loving girl. Did you read Nancy Drew growing up? Well the Clue Crew is a hip, modern version featuring a young Nancy Drew and her two best friends as they work together to uncover mysteries. My 2nd grader started reading these last year in 1st grade and we've gone through quite a bit of the series. They are engaging reads with characters that will appeal to this age group (especially girls). The characters are well behaved and well intentioned if a bit on the tame/boring side (in my opinion). The mysteries are not difficult to figure out. My daughter always figures them out before the Clue Crew and ends with a "See, I told you!" as we turn the last page. The vocabulary is geared towards the 2nd grade level (or an advanced 1st grade reader). Another chapter book series for newly independent readers. Daisy is sweet, spunky and extremely endearing. My 1st grader was instantly taken with her upon reading the first book in the series where we find she can communicate with animals. The animals lovers in your life won't be able to resist. This is a book we read together because it does have some some words that require assistance (which I love!). I enjoy a book that offers an opportunity to enrich vocabulary and challenge the reader. This is a great series with wonderful content. Stink! Just looking at the cover makes you want to pick it up and find out more, doesn't it? Add in the fact that Stink is Judy Moody's little brother and you have a hit. Stink is silly and clever and definitely appeals to both boys and girls. The book is interspersed with fun comic strips, written by Stink himself, which new readers enjoy having. Kylie Jean has been a hit with my 1st grader. Kylie Jean is a southern belle who loves pink and dreams of being a beauty queen. This series is definitely geared towards girly-girls who will certainly find themselves endeared with the main character. My older daughter wasn't as fond of the series because she's not the "beauty queen" type like my youngest it. If you have a pink loving, performance giving princess at home - you'll want to try this series! Can little girls be witches? Heidi Hecklebeck would certainly say "yes" because she is one! Don't worry she isn't the spooky, nightmare giving type of witch. The books are great for this age group because they have a large font, illustrations and wording and vocabulary geared for younger readers. Heidi is a witch in training, learning to use her powers while trying to conceal them and act like a regular 8 year old. The plot of these books make them very relatable and engrossing for kids. They are always a hit in our home. Bobby and his beagle Lucy are always up to something. It's impossible to resist the antics of this adorable puppy and her human friend. These books tell the tale of a special friendship between a boy and his dog. These books will keep your kids reading and working on those essential reading and comprehension skills. Another series about animals - can you tell my girls are pet lovers? Each book in this series features one of the main characters - the Critter Club members and a mystery involving an animal. Simple wording and illustrations make these great beginning chapter books. The characters are relatable and the addition of animals will appeal to many young readers. If you have girls in your house you have probably read a few of the Rainbow Magic books. They are drawn to them like moths to a flame! I find them extremely repetitive but my daughter can't get enough. Who would have thought there were so many types of fairies? They just keep coming out with more and I just keep buying them because it keeps my girls reading, haha. This falls into what I would call the "fluff" category - reading just for fun. I'm not embarrassed to admit that I fully advocate that. If my girls pull out a book versus the computer or television - I'm excited. Magic Tree House has been one of the most popular series in both my home and classroom over the years. Kids love these books! The characters are their age, the adventures are fascinating and you learn interesting facts while enjoying the books. Our library is stocked with this series and it's one that both my daughters enjoy. The earlier books are perfect for my 1st grader and my 2nd grader gets a bit more of a challenge from the more recents books in the series. The newer ones are a bit longer with more complex vocabulary which has allowed us to transition right along with the series. Some parents aren't huge fans of Junie B's behavior or language. We find her funny. I use those "oh no" moments to review how we should and should not behave/act. My girls enjoyed correcting her grammar and mispronunciations - they always found it hilarious. Nothing beats reading a book that makes you laugh out loud and Junie B always does that for us at some point in the story. These are great to read together. By now you can see that my girls enjoy reading mysteries. Nate the Great is a great series for beginners. The vocabulary is not difficult, the books are short (for chapter books) and they have color illustrations. Yet, they make beginning readers feel like they are moving past easy readers and delving into chapter books. My girls had great success with these books and still read them as independent readers on their own. Flat Stanley is such a fun series because there are so many different adventures to read and follow along with. This one gets used often in school but it's great to read at home and start your own "Flat Stanley" adventure with family and/or friends that live far away. Opposites attract - even in children's books! Bink and Gollie are friends who appear to be opposites but who actually complement each other in all the right ways. The characters are funny, the illustrations are like a comic book and add to the appeal of the story. These make excellent early readers because each book contains 3 stories versus chapters. This is one that the kids will want to keep reading. Roscoe Riley is a 1st grader who always seems to find himself involved in some sort of mishap. No worries though, he isn't naughty. There is nothing to fear in this series - just fun kid stuff. This series is great for 1st & 2nd graders who are delving into chapter books but still need illustrations (picture clues!) and a simplified vocabulary while telling an interesting and engaging story. I first read Mr. Putter & Tabby when I taught 2nd grade and always thought it was such a sweet book. In an age where so much is fast paced it's nice to read a series that doesn't rely on magic, crazy kid antics, etc. These stories will appeal to any animal loving children and there are quite a few in the series to explore. These are ideal for 1st graders. This series has been around awhile and though it has chapters, the chapters are actually short stories. The illustrations are nice, the vocabulary is simple enough for independent readers but still entertaining plot wise that it will keep them reading. Poppleton is a cute and funny pig and his adventures are always met with enthusiasm. These are Ready-to-Read Level 2 readers. Mudge totally makes this series a hit with kids. He's just the kind of dog kids wish they had! The books are short and sweet introductions to chapter books for children that are ready to make the transition. There are lots of books in this series and libraries are usually well stocked so you can enjoy them by the stack. I hope you found some fun new series to check out from our list. Be sure to let us know your favorites. We are always looking for new books to read too. Thanks for the suggestions! My kindergartener wants to read only Rainbow Magic, and sometimes Magic Tree House, and I would love to get her interested in a few other series. It can be hard to find chapter books appropriate for younger readers, so I appreciate your list. "The Littles" is another series my sister recommended; my daughter has only read one, but she thought it was fun. Another series to add to your list is the A to Z mysteries by Ron Roy. Reading level is second grade, but higher level first grade readers on up will enjoy these stories. I find the Magic Tree series can be more difficult for the first graders. They really need to understand the history to 'get" the story.